I became fascinated in French vintage and antique mannequins as a result of wanting to display Belle Epoque clothing in an authentic way. Initially, I knew nothing about the different manufacturers and purely concentrated on whether the mannequin buste was the right size and shape for the item to be displayed. Once I had a few different examples, I became fascinated by the mannequins themselves and now I am an avid collector. I thought others might benefit from me sharing a few tips on identifying the different manufacturers and on how to estimate the age of an antique or vintage mannequin. I made some expensive mistakes in the beginning which you can hopefully avoid! To learn about mannequin shapes, ages and manufacturers, I did extensive research. I soon found that I was not alone in my fascination and that there are some great blog posts on the subject. I've provided links to my favourites below. 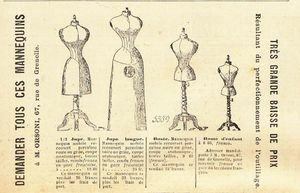 A pictorial document of the changing shape of papier mache mannequins can be found in this image advertising an Exposition retrospective des bustes mannequin It charts the changing ideal form from 1867 to 1895. Unfortunately we don't know which company made the mannequins pictured. One of my favourite blogs is http://stockman.canalblog.com/ It is full of wonderful images and information. The earliest photograph I could find was courtesy of this blog and shows Frederic Stockman in 1869 with one of his mannequins. The mannequin has a wonderful wasp waist, slightly dropped shoulders and a high bust. The stand has the look of multiple balls stacked. This model is now very rare. Another lovely little snippet on the Stockman Mania blog shows an entry in a Paris directory dated 1890 for the Stockman business. Notice that the mannequin foot in the image still has the stacked ball design. I also found this lovely entry showing an advert from La mode Parisienne de 1894. We now have a mannequin timeline emerging. As mannequins epitomised the ideal female form of their era, sites on corsets, which of course helped to sculpt that ideal figure, give us another insight which helps to date mannequins. Bridges on the Body carries a wonderful corset shape timeline spanning 1900 to 1919. Having these visual shape references for the mannequin busts, coupled with the the tripod stand types, gives us a good indication of the age of the mannequin for those of us who want to be more specific than the majority of sellers who describe them as circa 1900.